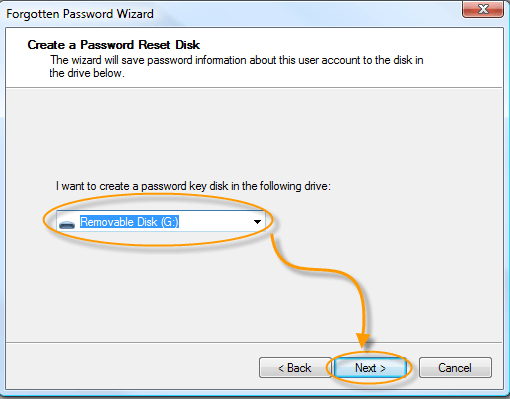 How to Create a Windows Vista Password Reset Disk? Forgetting Windows Vista password is quite frustrating, right? So it is recommended to create a Windows Vista Password Reset disk when we create a new account password. With this Vista Password Reset disk, we can easily reset the forgotten vista password and get right into our computer with ease. Note: If your computer is on a domain, a network administrator can help to reset your forgotten domain logon password. A password reset disk can only be created for local user accounts. Important: You will not be able to use a blank CD or DVD as a password reset disk in Windows Vista. Requirements: Before being able to create a Windows Vista password reset CD, you'll need removable media such as a USB flash drive or a floppy disk drive and blank floppy disk. Step 1: Click on "Start" button -> Control Panel -> User Accounts and Family Safety link -> User Accounts link. 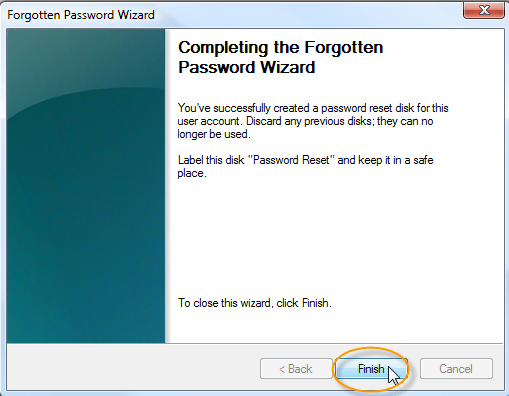 Step 2: click the "Create a password reset disk" link on the upper left-hand side. 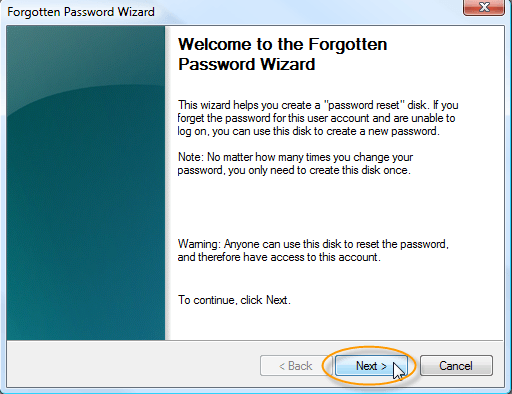 Step 3: When the "Forgotten Password Wizard" window appears, click "Next". Step 4: Choose the portable media drive to create a password reset disk on, Click "Next" to continue. 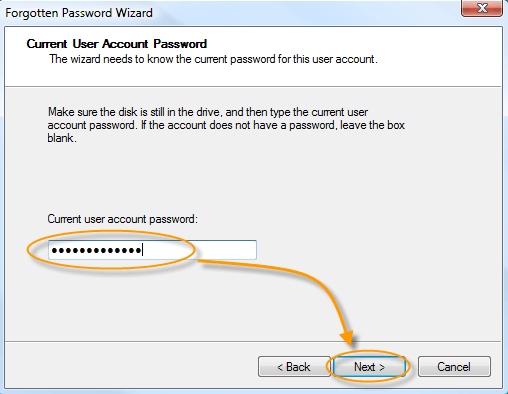 Step 5: With the disk still in the drive, enter your current user account password in the text box, and click "Next". Step 6: When the progress indicator shows 100% complete, click "Next" and then click "Finish" in the next window to finish your job. You can now remove the flash drive or floppy disk from your computer. 1: The windows vista password reset disk is essentially a small file that can be used to reset a forgotten vista password, and you only need to create Windows Vista disk for login password once. No matter how many times you change your password since creating this disk, it will always allow you to reset a new password. 2: Keep in mind that anyone who possesses this Vista password reset disk will be able to reset your account password at any time. So, make sure you store your Vista password reset disk in a safe place. 3: If you've already forgotten your Windows Vista password and don't have a Windows Vista password reset disk, you can still preform Windows Vista password reset with Windows Password Recovery Professional. Windows Password Recovery Professional are popular solutions to reset forgotten Vista password by burning the program to CD/DVD or USB flash drive.